Successfully Added 1.8-inch Screen New Style Stainless Metal Shell MP4 Player, 1GB to your Shopping Cart. 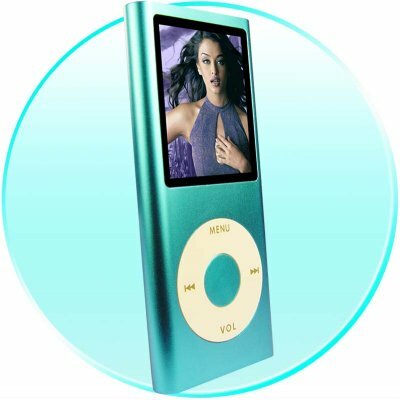 An easy to use, ultra thin, crisp video/sound quality MP4 Player. This flash video/music player is consistently a hot seller, due to straightforward controls, superb media playback, a 1.8-inch screen, fast data transfer via USB 2.0, and a very attractive style. Colours available- Blue; Green; Black; Silver; Pink Please specify the colour(s) you require using the comments box in the online checkout process..
Multi formats support: AMV, MP2, MP3, WMA, WMV, ASF, WAV etc. This MP4 player is slim and light, made of stainless metal. The screen is 1.8 inches diagonally and is in full colour. The image quality is extremely clear from a wide angle of view, and so it is perfect for watching music videos and slideshows of your digital photos. Built-in rechargeable battery. Plays for 6 hours (music only) or 3 hours (video; screen on). Recharges directly from computer via USB. Also included is a USB-power adapter which lets you plug the player in for recharging in a normal mains socket. Works with both 110V and 220V. Socket adapter supplied by Chinavasion according to delivery destination. FCC and CE compliant. Consistent record of successful importing to wholesale buyers worldwide. Login for wholesale discount prices, no MOQ.